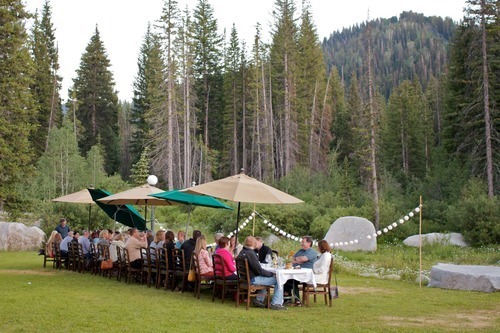 Solitude has re-envisioned what outdoor dining should be with the introduction of their Wasatch Mountain Table dinner series. 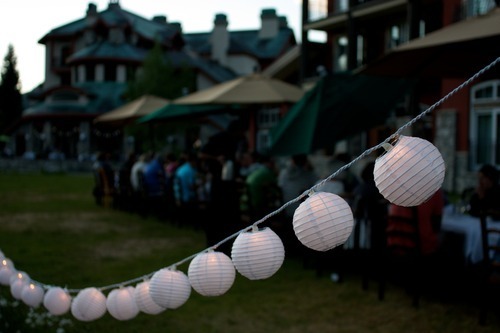 Set just outside the St Bernard’s restaurant along the bank of the Big Cottonwood creek, it is the perfect spot for getting together with friends to enjoy each others’ company, as well as Chef Michael Richey’s creations. 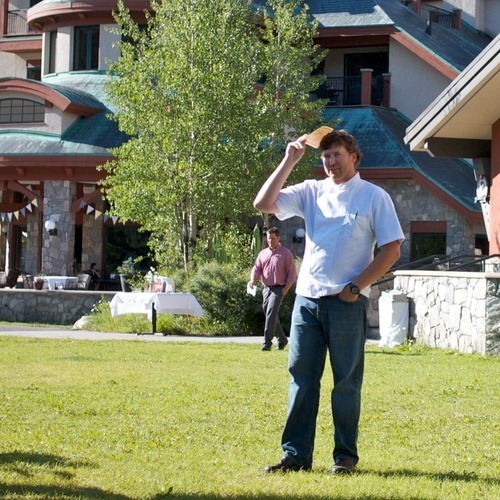 Chef Richey was formerly the chef at Pago and The Tree Room at Sundance Resort. I was lucky to be invited to take part in the dinner and share my thoughts on the experience. 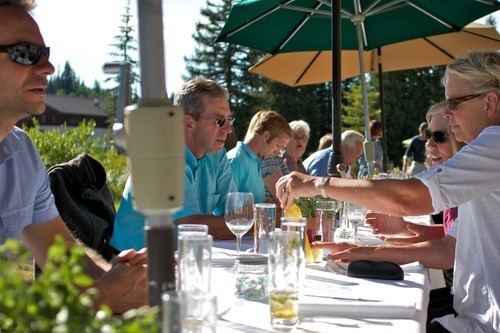 Forty guests are seated at a long communal table, which provides ample opportunity to get to know new people and better get to know old friends. To my right sat an auto parts salesman who also happened to be a CIA graduate from New York. Across from me was one of Salt Lake’s leading interior designers. Needless to say, while our conversation bounced around from hospitals to car parts to motorcycles and cooking, there was never a lack of interesting topics. Anyone familiar with Chef Michael Richey’s style knows that he focuses on sourcing as many of his ingredients as close to the kitchen as possible. Many of the ingredients from tonight’s dinner, such as honey vinegar, tomatoes, eggs, and apricots, are sourced along the Wasatch Front. For other ingredients where sourcing locally isn’t an option (i.e. wild King salmon), ingredients are sourced regionally. Tonight’s dinner featured products from M&M Farm (in Richey’s opinion the best produce in Salt Lake City), Slide Ridge Honey, Sandhill Farms, Clifford Farm, and Mystic Salmon. 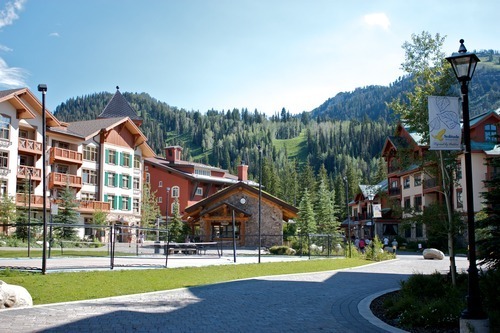 Kelli Bess, from Slide Ridge, took a moment to tell us the Slide Ridge story. 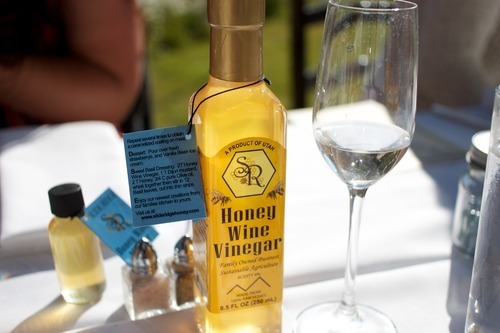 They are family-owned, produce a variety of honeys, honey wine vinegar, mead, and are now producing honey wine (they are a federally licensed winery). It was fun to put a face and story to one of the products we were going to enjoy that evening. Our evening began with some delicious appetizers. 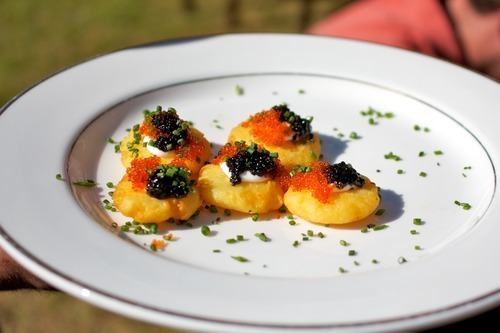 The first were the M&M Farm Yukon Gold potato pillows topped with American Sturgeon Caviar. For those of you who may be caviar novices (like me), let me calm your fears: If you’ve ever had tobiko at a sushi place, you pretty much know what you’re getting into with caviar. This was my second favorite dish of the evening. 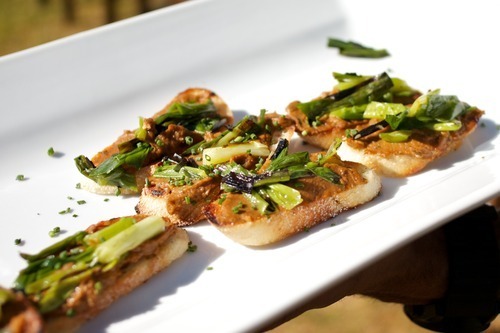 The next dish was a bruschetta topped with romesco, grilled green onions, and black garlic. Rich, crunchy, and delicious. 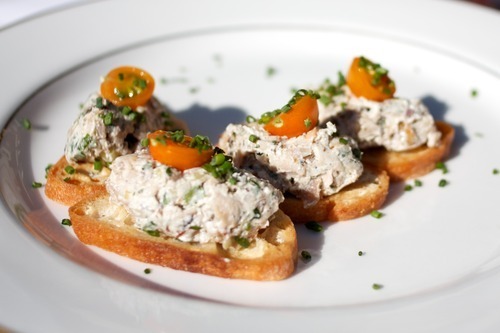 Next up were the Utah pork rillettes with grilled bread. Think chicken or tuna salad, except taken to the next level with pork as the protein. 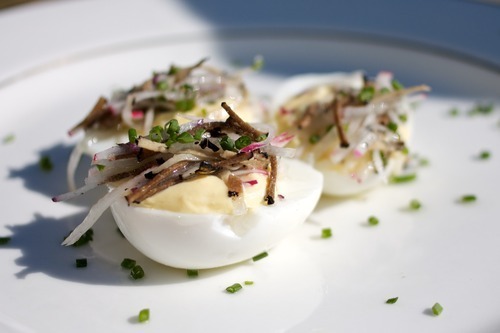 Our final appetizer was deviled Clifford Farms eggs topped with icicle radish, black truffles, and chives. Now, on to the dinner. 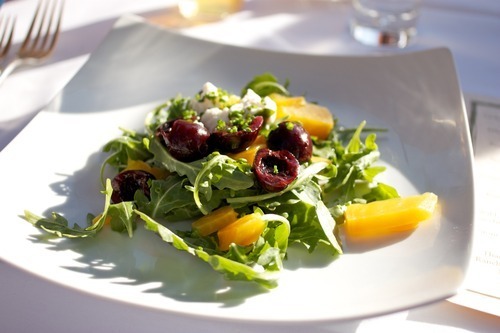 Arugula salad with cherries, roasted yellow beets, and the most deliciously smooth house-made ricotta cheese that I’ve ever had. The salad was dressed with a Slide Ridge Honey vinaigrette. 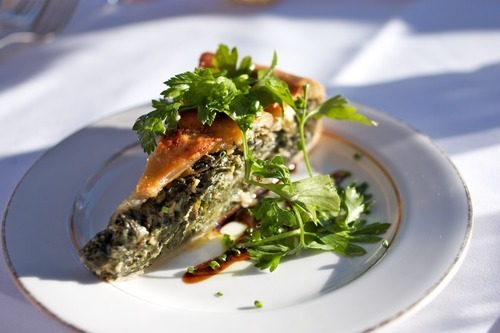 Maple Torta with braising greens, chevre, caramelized onions, and a balsamic reduction. 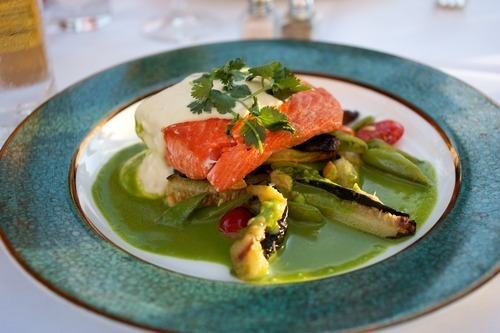 Wild King Salmon with snap peas, roasted eggplant, zucchini, cherry tomatoes, basil nage, and corn pone. This dish stole the show with an absolutely killer variety of flavors and textures. Everything about this dish was perfection, from the deeply roasted eggplant to the wonderfully herby nage to the amazingly deep and rich corn pone. And of course don’t forget the tastiest piece of salmon I’ve ever had. Somebody get cracking on legalizing marrying food, because I just found my soulmate. Definitely my favorite dish of the evening. 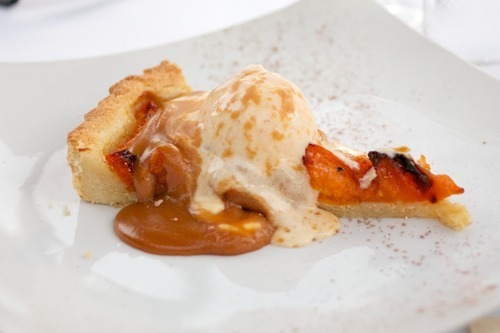 Stone fruit tart with apricot ice cream and bourbon caramel. Anybody who knows me knows I’m not much of a cooked fruit guy, especially in desserts. Something about the texture that gets me. But I put that aside and I’m glad I did because the tart was wonderful. The tart featured a nice crust and a delicious house-made apricot ice cream. For those who missed out on this dinner, you’re in luck. 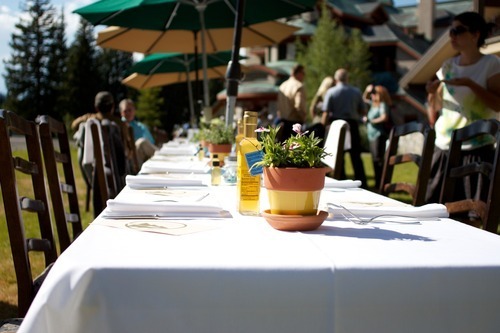 Solitude is hosting three more of these dinners throughout the Summer, on July 28th, August 18th, and September 15th. 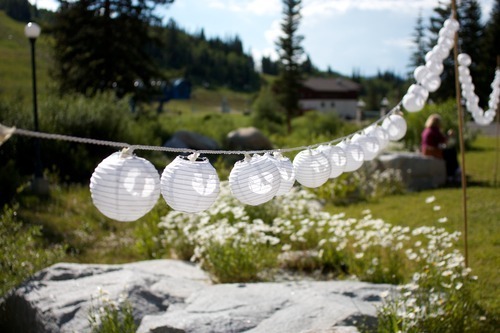 Be sure to bring a jacket, as the temperature drops noticeably the second the sun disappears behind the mountains. 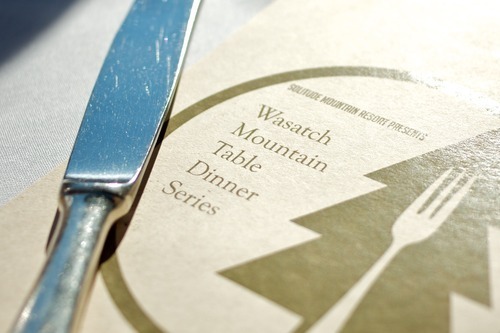 Click here to go over to Solitude’s site to get more info on the Wasatch Mountain Table.